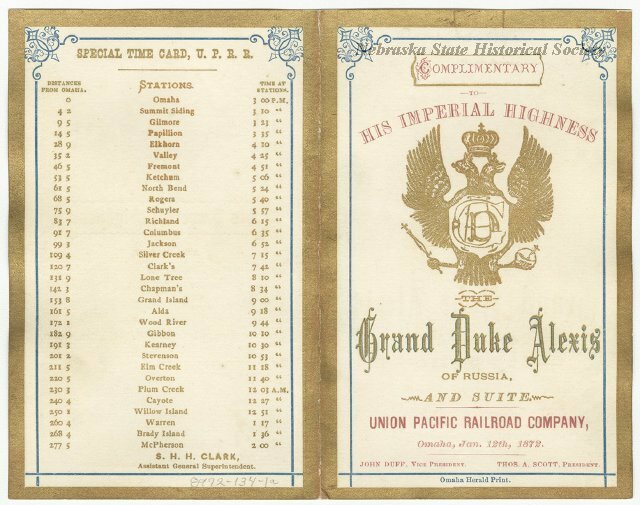 During the winter of 1871-72, the Grand Duke Alexis, fourth son of Tsar Alexander II of Russia, paid a good-will visit to the United States. General Phil Sheridan arranged for a buffalo hunt to be held in his honor. The hunt camp-site was about a mile north of here on Red Willow Creek. It was a short distance above the point where a Fort McPherson-Republican Valley military road crossed the creek 1/2 mile east of here. The hunt took place January 13-15, 1872. Alexis was accompanied by Russian officials and servants. General Sheridan's party included Generals George Custer and George Forsyth. Buffalo Bill Cody was the guide and chief hunter. Many officers, enlisted men and civilians were required to run the camp. Chief Spotted Tail and an encampment of Brule Sioux entertained with dances and shooting exhibition. Alexis and others succeeded in killing a number of buffalo, and nightly celebrations were held. Within two years, the buffalo were gone, and pioneer ranchers moved into the area. A decade later, hundreds of homesteaders moved into the area and Hayes County was organized in 1885. 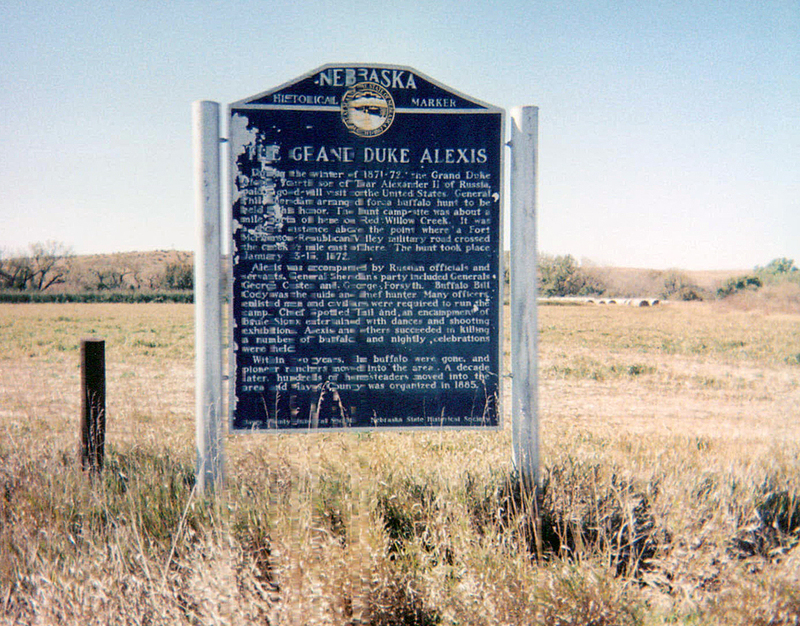 “The Grand Duke Alexis,” Explore Nebraska History, accessed April 18, 2019, https://mynehistory.com/items/show/272.